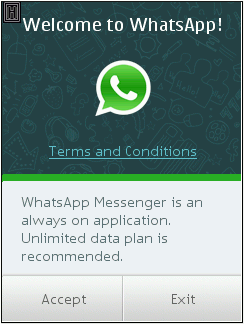 Whatsapp is a very popular messaging service that was recently acquired by Facebook. It lets you post status updates, images, videos and your location all of which are instantly shared with your friends. Nokia Asha: 201, 205 Chat Edition, 206 Single Sim, 208, 210, 300, 301, 302, 303, 305, 306, 308, 309, 310, 311, 515, 500, 501, 502, 503, 230. Whatsapp reportedly works on at least a few other Nokia S40 and Asha phones. But if you don’t have one of the supported phones, the Whatsapp site and the Nokia Store won’t even let you download it. Even if you do manage to download it you will get an “unsupported device” error when you try to run it. 1) The process is easiest if you have a PC and a USB cable for your phone. If you do, download the jad and jar files listed below to your PC and copy them to the Apps & Games folder on your phone’s memory card. Then skip to step 6 below. 2) If you don’t have a PC, open this page with the UC Browser on your phone and tap or click the jad file link below and choose “Save”. Change the download path to E:/Apps&Games and hit “OK” and then “Save” to download the file. Do the same for the jar file. 3) Next, open the Games&Apps folder on your phone and choose Memory Card. then choose Apps&games and you should see whatsapp_jad and whatsapp_jar. 6) Open the Apps&Games folder on the phone and tap the memory card folder and then the Apps&Games folder. Press and hold or highlight the Whatsapp icon and choose options and then “Update version”. If it tells you that you already have the latest version and asks if you want to replace it, choose ” Yes”. After the update finishes tap the Instagram icon again toinstall it. You can try installing Whatsapp on non-Nokia phones but it’s unlikely to work. The app “WhatsApp” (1775 KB) is ready to download or send to your phone as filename:”whatsapp”. Sorry, I have no idea why WhatsApp is not working on your phone. You could try uninstalling it and reinstalling it following the instructions in the post. That might work. how to worked on whatsap app an my device please tel me solution i wil waiting for ur answer thnq sir……….! The Nokia X2-01 is listed as a supported phone by WhatsApp so you should be able to download it from https://www.whatsapp.com/s40/ and get help directly from WhatsApp if you have problems. I have downloaded whatsapp for nokia c2 00.It started but it says that your data roaming is off and says me to change settings.But when i select change setting it does not complete. Try temporarily setting your phone’s date to 2014. That might let you install the app. After you install be sure to set the date back to today. hlo my name is malu ram sharma. This app is very useful but 31dec. Close. Sir pls. Don’t close this app nokia s40. Try the unsigned version of WhatsApp. The link is in the post. Sir my nokia c1-01 whatsapp not supported why? WhatsApp was only designed to work on certain phones and the Mokia C1-01 isn’t one of them. is there any link to download whatssapp for nokia x2-05?? The WhatsApp version on this page is the only one I have and the only Java ME one I’m aware of. Try it on your Nokia X2-05 and leave a comment saying if it worked or not. Click “How to Download” in the top menu for downloading instructions. Does whatsapp work on micromax x606? As far a I know, WhatsApp doesn’t work on the Micromax X606. The Nokia Asha 200 is not supported by WhatsApp. You can try the version on this page. It might work, but probably won’t.